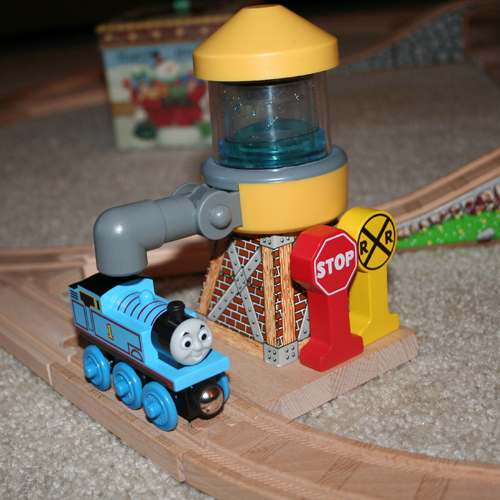 Our Kids' Blog » Blog Archive » Trains! Mommy is a train person, Grandpa is a train person, Daddy sure likes to build track, and we are starting early to create little train girls. This year the girls started their Thomas the Train collection. There has been a layed out track everyday since Christmas with engines running around it. Robby was chomping at the bit to build track layouts with all of the track, but we thought it would be best to wait for Emily to get used to the toy with just the starter set. Emily has enjoyed talking to the engines and quickly wanted to name the engines that didn’t come with names. She hasn’t mastered all of the rules of trains, like she thinks they can make turns and double back at switches. It is really cute. 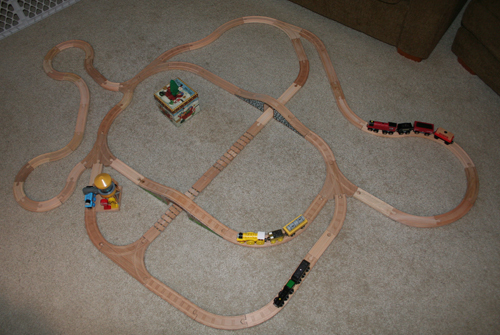 After a few days of the simple layout Robby has started building larger track layouts that take up almost the whole floor. Amazingly the girls play with it for a while before destroying it and when it is destroyed it is always Julia’s work. Julia has been imitating the rest of us by running the engines around the track some too. This is going to be one fun toy for a while! Posted in Emily Pics, Julia Pics | Comments Off on Trains!